Good condition Nissan Note Tekna Auto 2008 in Black. Slight scuff on front nearside bumper. Otherwise very tidy. MOT Jul 19. Next MOT due 25/07/2019, Full service history, Black, 3 owners. Advertised elsewhere so may end early. TOP OF THE RANGE JUKE N-TEC 2013 . First see will buy it. A bright Pink Nissan Micra Cabriolet. I MADE A MISTAKE ON THE MILEAGE AND ONLY WAY I COULD CORRECT IT WAS BY CANCELLING AND STARTING AGAIN. Collection only. 4 new tyres. 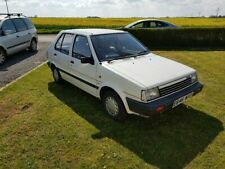 Nissan Micra 1992 - full history, genuine 25000 miles ! In the last 10 years it has only averaged 100 miles per year but was serviced regularly. Nissan Leaf, excellent condition, full dealer service history, battery checked at 100% 04/2019. Top of the range Tekna, leather seats, Bose sound system, parking camera, Bluetooth, security glass, charge cable, and charger. Alloy wheels. NISSAN PAO PK10. VERY RARE MANUAL GEARBOX. ONLY 48,000 MILES. A very rare manual version of this popular classic, in fact I have never seen another one advertised in the UK. This is a very different car that can be used as daily transport and certainly turns heads wherever it goes! It is MOT'd & serviced until March 2020. It has a full service history. Cheap to run - Full tank is £35-40 (depending on where you fill up). It has had new tyres in Oct 2017 - and there is 6mm left on front tyres, 8 mm left on rear tyres. Only 26,000 Miles, From New. Full mot 1 advisory that has been rectified.44382 miles air bags air conditioning, cd/radio, mp3 aux socket. £3950 ono. I HAVE THE LOGBOOK, THE MOT IS UNTIL APRIL 2020 AND 2 KEYS. THERE IS FULL SERVICE HISTORY AND I HAVE ALSO BEEN ON THE VOSA WEBSITE WHICH WOULD CONFIRM MILEAGE AS CORRECT, PLUS THE CAR IS ONLY 1 OWNER. For Sale is a Nissan Micra N-TEC 1.2L Silver Manual 4 doo r. It has been serviced and has 12 months MOT. The vehicle has Sat Nav and alloy wheels on it. The vehicle is very clean on the inside and outside and it has a very low mileage of 33000. 1500cc engine with a 3 speed automatic transmission, as they all are. All S-Cargos were built with KM gauges, so the mileage is 36,945miles = 59,458km. This example has the only two optional extras from the factory which where the port hole side windows and the electric roof. Only 31,000 Miles From New. Kent Motoring Company ltd - Call us on 441622239740 or click here to find out more. Prairie 2.4 LX. Alloy Wheels, Adjustable Seats & Steering Column, Colour Coded Body, Four Seats, Front Head Rests, First Aid Kit Fire Extinguisher, Full Size Spare Wheel, Interior Mats, Manual Windows, Power Steering, Rear Wiper, Rear Spoiler, Rear Fog Light, Sony CD, Stereo /Radio, Sunshine Roof. For Sale 2010 Nissan Micra 1.2 3door manual transmission, low mileage, Mot till feb 2020, service history, recently serviced, no scratches. Hpi clear. Call or txt for info. Manor Garage - Great quality, affordable cars - Call us on 441904230468 or click here to find out more. 2014 Nissan Juke 1.5 DIESEL N-TEC. CAT-N- WE CHANGED FRONT BUMPER AND BONNET. MOT TILL 10/04/2020. Clean inside Out. break pads. The car was serviced also we changed new front. Rear folding seats. 2012 Nissan Juke Tekna 1.5 Dci 62 Plate Top of the range. Gauging interest in my Nissan gloria 3.0 v6 auto that I've imported to be my new daily. DVD player with 4 screens. Custom led speaker build in the front doors and rear parcel shelf. Custom green pearl paint . David Hayton Trade Centre Carlisle - Visit us for a test drive - Call us on 441228588341 or click here to find out more. Sharnford Garage ltd - Visit us for a test drive - Call us on 441455244514 or click here to find out more. White Nissan Juke 1.5 Diesel Pure Drive , 2013. White Nissan Juke 1.5 Diesel Pure Drive, Manual, 5 doors, power steering. FRONT ARM REST. 2 SET OF KEYS. CD/RADIO/AUX PORT. MOT 07/08/2019. CENTRAL LOCKING. ELECTRIC MIRRORS. ELECTRIC WINDOWS. AUXILIARY HEATING. 2012 NISSAN QASHQAI ACENTA, 1.6, PETROL, 35K MILES, MANUAL, REAR PARKING SENSORS, DAB, BLUETOOTH, CD PLAYER, ALLOYS, SERVICE HISTORY, MOT, EXCELLENT CONDITION, DRIVES PERFECT.